Beautiful Walkout Bungalow with ICF Construction, Full City Services, Quad Garage on a ½ acre lot backing on to an Environmental Reserve within minutes of Edmonton! The main floor features a large front entry, with a walkthrough closet giving access from both the front & back garage door. The gorgeous kitchen features Quartz Countertops, Upgraded Appliances, a large Walk-through Pantry & overlooks the dining & living room with a gas fireplace and soaring ceilings. Your master suite offers an impressive walk-in closet in the 5-piece ensuite. Plus there is an additional bedroom, bathroom & main floor laundry/mud room. The Walk-out basement provides a perfect family area with enough space for your home theatre experience. Projector & Screen Stay! A 2nd gas fireplace, wet-bar that could be easily converted to a second kitchen, 2 additional large bedrooms & another full bathroom. 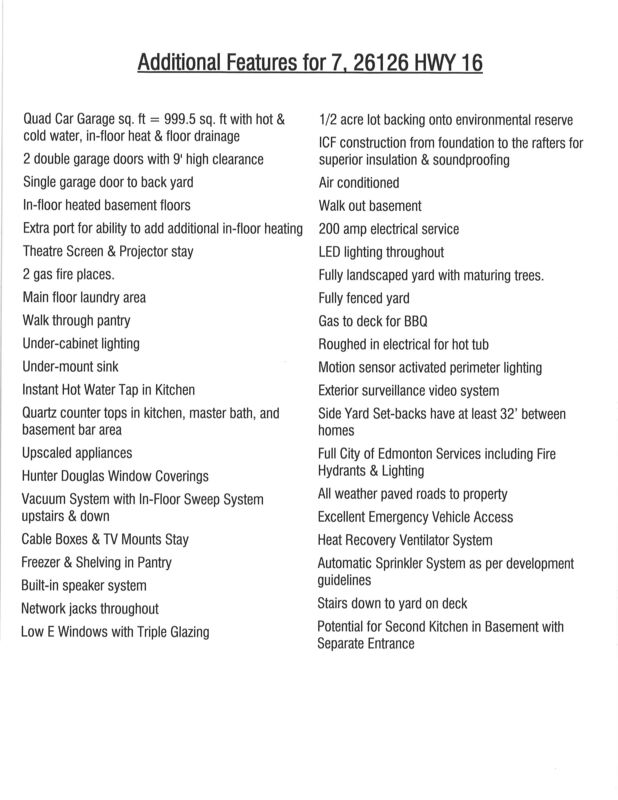 ICF Construction (foundation to rafters), Air Conditioning & so much more, this is a must see!